Professional Development and Training Courses Ontario • Frank. Want to help your team kick goals, smash targets and have more fun at work? You can! 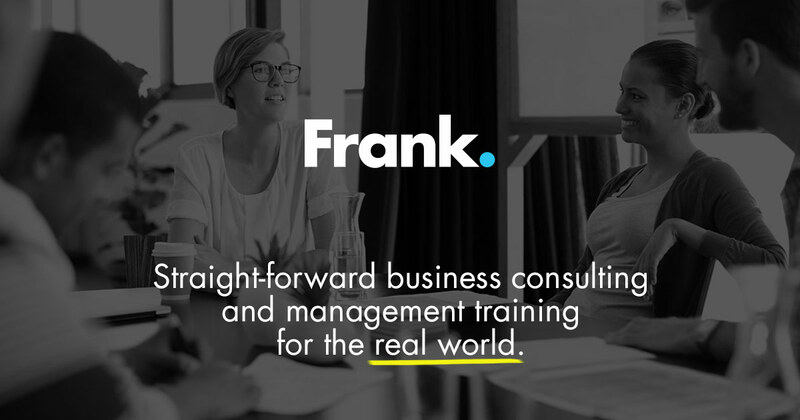 Frank’s professional development and management training courses address the most common issues that hold businesses back. You’ll be armed with the Swiss Army Knife of business tools so you’ll know what to do (and what not to do!) in the jungle we call “the office”. You know the death-by-PowerPoint management training you’ve signed up for in the past? Yeah, that’s not our style. We know you’re busy, so Frank’s business courses have a Zero Fluff, Just The Good Stuff Policy. Presentations and group discussions are fun, get to the point and most importantly, they’re practical. You’ll be ready to take action and start seeing results right away. Motivational posters of animals with the word “teamwork” along with an inspirational quote aren’t the answer to increasing team productivity. Teams That Actually Work gets employees on the same page, excelling in each of their roles, and working cohesively toward shared goals. During the session, participants are split into teams and conduct a group assessment to understand the effectiveness of how their unit functions. Once managers understand team dynamics and stages of development, they will be able to quickly assess what their teams need to make them more successful. The best leaders are the ones who can control time rather than letting it control them. This course helps you understand the difference between urgent and important; spot the issues that put your time management at risk; and discover your special sauce leadership style. Controlling Time is packed with practical advice, ideas and inspiration to manage time more successfully. Frank knows conflict happens to the best of us. But often managers avoid dealing directly with conflict in the hope it will resolve itself. But conflicts left unattended almost always blow up later or lurk underground only to re-emerge and create even nastier issues. To avoid WW3 (Workplace War 3), conflict management training is essential for all managers. This course is an excellent introduction to basic conflict theory, different conflict styles, underlying causes of conflict, and how conflict should be addressed. Nothing is more stressful than deal with challenging staff, co-workers, supervisors or irate customers. When situations get heated, nasty things are often said or done, creating permanent rifts in the workplace. This course equips you with real practical skills to stop difficult people in their tracks when these unexpected situations occur. Customer service is one of the most powerful marketing tools for business. Employees are the voice and face of your organization, and positive interactions can lead to happy and loyal customers. This customer service course shows your employees simple ways to exceed customer expectations making them feel welcome and appreciated. It’ll also cover what to do and what not to do in a variety of workplace settings. Our company’s core leadership team came back from Frank’s training enthused, reinvigorated and excited to implement what they had learned in the session. I have no doubt our investment our staff will pay off in spades. We attended the teamwork training course a few months ago and are so glad we did! Frank facilitators guided us through the process in a focused but relaxed way. We learnt how to make great decisions quickly, ensuring we had input from the entire team. Since returning to the office, the valuable skills we acquired in the session have come in handy time and time again.